Scott Lemperle said further dining services improvements will be made this summer. 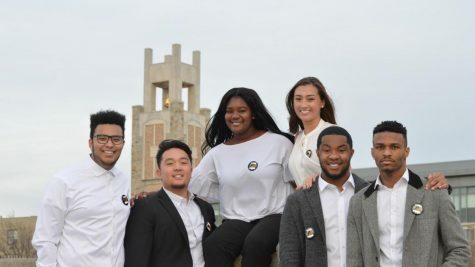 In a recent statement to the Torch, Auxiliary and Conference Services Executive Director, Scott Lemperle, expressed their dedication to keeping an open dialogue between them and the student body as they work to find cost-effective ways to provide dining services. In recent months students may have noticed several changes to the dining services on campus. Some of these changes include a rebranding of the marketplace into Montgoris Market, which included new decor and new food options that dining services advertised in a Twitter post such as gluten free bread and vegan cookie dough. According to Lemperle, some new additions include the implementation of a twice weekly “Innovation Kitchen Station” where students are served freshly made meals, a spice rack and more “Teaching Kitchen” seminars hosted in Montgoris Dining Hall. Hollie Schiebler, a resident sophomore student, said she noticed the new implementations. In the Marillac Cafeteria the “Market Express” was also added, where students can grab a quick snack or a Starbucks coffee. “I’ve never seen anyone buy things there but maybe that would be better when you’re in a rush, [since] I know the Outtakes line gets long during break times,” junior Sam Abad said of the new addition to Marillac Cafeteria. In the second SGI meeting of the semester on Feb. 11, Vice President Christopher Stephens described a recent meeting with Dining Services in which representatives from Chartwells expressed concerns that money is being lost due to students taking plates, utensils and cups from the dining hall. While students may not think taking a fork or cup here and there makes a significant impact on dining services, there are costs that add up associated with replacing these items and maintaining the inventory of utensils in the dining hall. 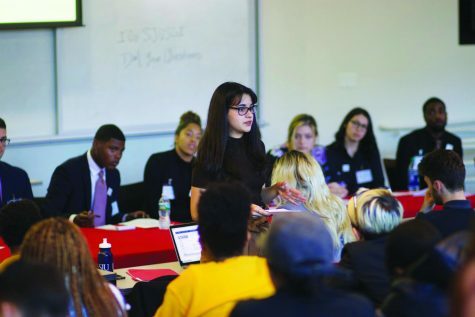 In this discussion, the idea of ending transitioning hours from the Red Storm Diner to Montgoris Hall to keep Montgoris open longer in order to save money was proposed. 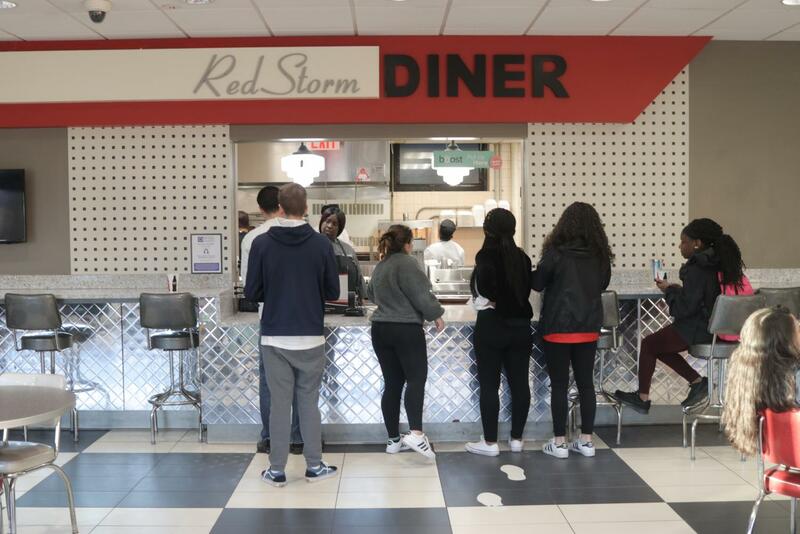 The Red Storm Diner is considered a staple of St. John’s campus culture and the idea of closing the diner troubles some students. Senior Moriah Gaskill was one of those opposed to the idea of potentially closing the diner, even as her time on campus is coming to a close. SGI meets with Dining Services on the first of every month. According to Stephens, due to spring break, there was no meeting for the month of March to discuss these ideas further. Lemperle explained that the idea of closing the diner was introduced in a “brainstorm manner” and there are no current plans in place to do so. 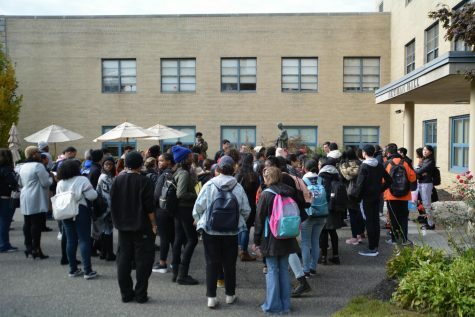 Lemperle said that further dining services improvements can be expected this summer and that concepts for a replacement of the existing Library Café are currently being considered. The current Library Café consists of a Red Mango and several tables where students can sit. Sophomore Cameron Smith said he would like to see some updates made to the Library Café.